Often when a show goes off the air, die-hard fans will lobby to get it returned to tv. Only rarely does it work. The original Star Trek would have only lasted two seasons if not for an early legion of geeks, while Cagney & Lacey got an extra five. Farscape got probably the highest-profile second life, with the kickass Peacekeeper Wars mini. Firefly got sent to the big screen, while Enterprise (thankfully) got sent to the trash heap. Okay, so the efforts aren't always successful. But for all that, there's only one show that was resurrected thanks solely to a concrete display of financial support: Family Guy. Originally little more than yet another Fox attempt to cash in on the Simpsons' success, Family Guy proved to be fairly clever and mildly popular - two things that almost guaranteed its cancellation. But now the show is back - how's that? Family Guy was saved not by its fans and an organized letter-writing campaign, but by itself. First, Cartoon Network picked up reruns of the show and, putting it in a regular timeslot where fans could find it, got huge ratings, launching the channel to the top of the cable charts and inspiring Neilsen, the tv ratings people, to monitor Adult Swim separately from the rest of Cartoon Network during sweeps. Secondly, season-set DVDs were released, selling 2.2 million copies in their first year, and were the #1-selling TV-based DVDs for 2003. So while fans saved the show, they did it just by being fans, not by any concerted effort. 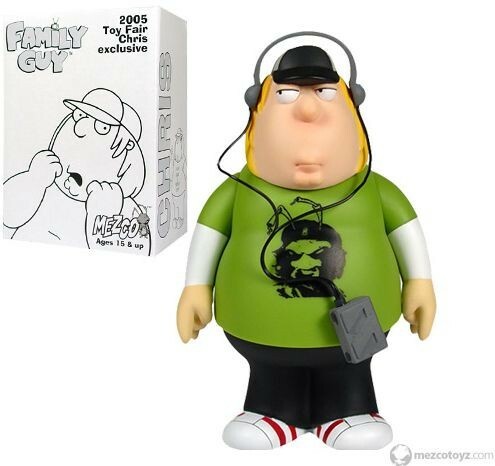 At Toy Fair 2005, Mezco gave out an exclusive variant Chris Griffin. Rather than something seen on the show, it's an original design: Chris is wearing one of the shirts Mezco sells through its online store. The shirt is army green, has 20th Century Fox and Mezco logos on the back and an image of Mezco's cool little roach mascot as Che Guevara (RoaChe, as they call him) on the front. The figure is 5 1/2" tall and moves at the Springfield Four. Or is that now the Quahog Four? Whatever your geographical preference, Chris is articulated only at the neck, shoulders and waist. Yes, Mezco's Family Guy figures are hollow, rotocast pieces, but isn't that still rather light? Chris's hands are in the classic Gene Simmons RAWK pose, but because the lad doesn't have any wrists, he can't turn his hands toward the front as he should. While the standard Chris had one of the line's best accessories - the evil monkey that lives in his closet - Toy Fair Chris has a distinct simian deficiency. He does have his tape player and headphones, but that's it. The Walkman plugs into his belly so that it seems to be attached to his belt, and the headphones are molded to fit perfectly over his ears. Included in the box with the figure is a cardboard backdrop of the Griffin's livingroom and two pages of stickers featuring Chris and the rest of the family, so you can make little dioramas. It's a nice idea, but would have been better as Colorforms rather than stickers (people do remember Colorforms, right? Those things were awesome). The sculpt of the figure looks exactly like the cartoon - Chris looks more like his dad than his mom, what with the bulbous nose and that distinctive Griffin chin. He's wearing his usual hat and earrings, and is looking off to the right. The regular figures all had several "expression" variants: since the eyes and eyelids are just painted on, it was easy for Mezco to make the family happy, sad, surprised, sleepy or whatever else they could come up with. There are no such variants for this exclusive, so at least the scalpers won't be able to screw you there. Toy Fair Chris does exactly what a good exclusive should: he looks cool and provides a nice taste of what the series has to offer. If you couldn't find Chris in the first series, then this version would fill the hole in your collection perfectly. Heck, even if you're not interested in Family Guy, this is a decent figure in its own right.